Major Paul M. Bernat was named as the City of Dover’s 13th Chief of Police. 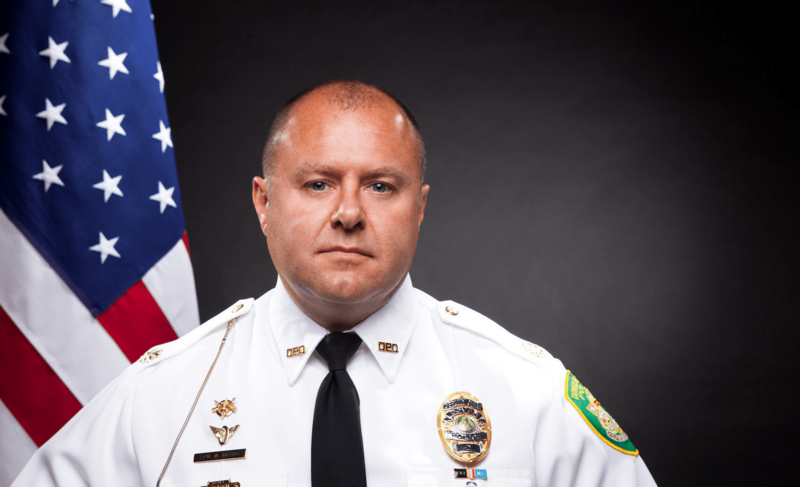 On Tuesday, March 25th, the City of Dover Police Department announced that Major Paul M. Bernat would become the department’s 13th Chief of Police, filling the position most recently held by Chief James E. Hosfelt, Jr., who is retiring on April 4th. The son of an Air Force family, Bernat moved to the State of Delaware in 1976 and has resided in the Dover area for the past 38 years. Major Bernat is a 1985 graduate of Caesar Rodney High School and received his Associate’s Degree in Criminal Justice from Delaware Technical Community College in 1992. Bernat continued his education at Wilmington University, earning his Bachelor of Science, Criminal Justice Degree in 2002. `He would later be selected to attend the prestigious FBI National Academy in Quantico, VA where he graduated in 2009 as a member of the 236th FBI Academy Class. Major Bernat began his law enforcement career in March of 1988 with the Bethany Beach Police Department. After graduation from the Delaware State Police Academy and serving the Town of Bethany Beach for sixteen months, Bernat joined the City of Dover Police Department in July of 1989 where he spent the first ten years of his career as a Patrol Officer, seven of them as a K-9 Officer. In July of 1997, Bernat earned the rank of Corporal and continued to serve in the Patrol unit as a section leader until October of 1999, when he was transferred to the Special Enforcement Unit as a member of the Motorcycle Division. Major Bernat continued his climb through the ranks, earning his Sergeant stripes in September of 2001, becoming the Special Unit Enforcement Supervisor. During his time in this position, he oversaw the Community Policing Unit, Motorcycle Unit, Parking Enforcement Unit, and Animal Control for the City of Dover. Major Bernat earned his first Staff Officer rank in March of 2005 when he became a Lieutenant and the Special Enforcement Unit (SEU) Commander. In addition to his duties as the SEU Commander, Bernat assumed the responsibility of Emergency preparedness for the City of Dover until 2008, when he was transferred to the position of Patrol Unit Commander, holding the same rank. In November of 2009, Bernat was promoted to the rank of Captain and was assigned to the Operations Commander position. Bernat earned his current rank of Major in April of 2010, where he has served for the last four years. Major Bernat reached the pinnacle of his law enforcement career when it was announced that he was chosen to be the 13th Chief of the Dover Police Department. Bernat will be sworn in as the Chief of Police on Friday, April 4th by Dover Mayor Carleton E. Carey, Sr.
Bernat resides in Camden, Delaware with his wife of 25 years, Tina and his daughters Rachel (21) and Rebekah (16). The City of Dover Police Department will hold a press conference on Friday, March 28th, at 10:00am in the Dover Police Department’s Public Assembly Room to introduce Major Paul M. Bernat as the new Chief of The Dover Police Department. Due to limited availability during the next several days and weeks, this will be the ONLY opportunity for media members to conduct interviews with the new Chief at this time. Members of the media are asked to arrive on time and have all necessary equipment set up by the designated 10:00am start time. We thank you for your continued support of the Dover Police Department and look forward to your attendance. Questions/Concerns should be addressed with the Public Information Officer, Corporal Mark Hoffman, at 302-736-7130 or mark.hoffman@cj.state.de.us.